Encore 300 | CSESCO INC.
Encore® 300 adds benefit to your site. 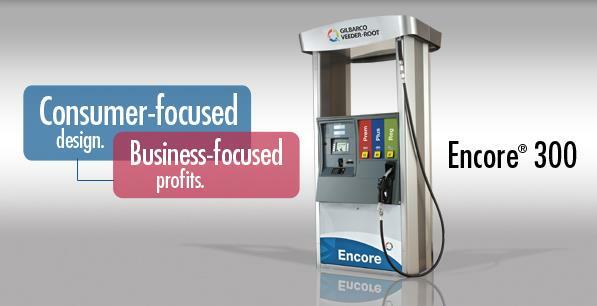 Economical and flexible-Encore® 300 is the textbook definition of value, designed specifically for those needing a forecourt system for fundamental petroleum retailing practices. Customer Convenience-The ATM-style design is the most widely accepted user interface in the world, transcending all nations and cultures. Encore 300 brings this established user interface to the fueling dispenser and centralizes customer decisions into one convenient area. Large brand panels and distributed price displays are located at eye-level for quick fuel grade identification. Lower Cost of Ownership-With such features as our new C+ flow-through meter, Digital Valve, electronic calibration, and conventional E300 electronics, servicing Encore 300 is straightforward. Service providers can easily access electronics through the centrally located "refrigerator-type" door. Site operators will find convenient access via the Customer Interface Module (CIM) for routine tasks such as reloading printers, or emptying cash acceptors. Increased Revenue-By attracting new and loyal customers, Encore 300 reinforces repeat business by being convenient and easy to use. While fueling, customers make additional purchase decisions right at the pump, to increase business inside your store and at the fuel island.